Khao tom is a dish which is eaten all over South East Asia in one form or another, although the dish is most closely associated with Thailand and Laos. Khao tom is a dish which comes in many varieties, it can be a savoury or sweet, contain meat or be a vegetarian dish, but the defining characteristic of all varieties of khao tom is that sticky rice and other ingredients are steamed in a banana leaf. In Thailand khao tom is normally eaten as a sweet dish and commonly referred to as khao tom mat. 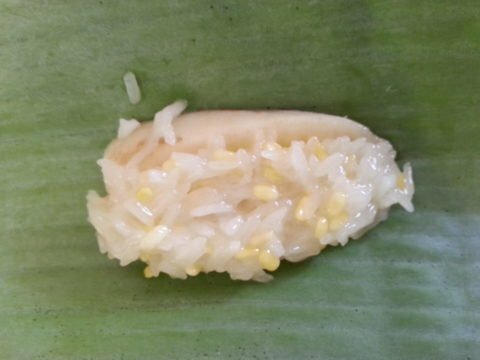 In its most basic form the dish consists of sticky rice sweetened with coconut milk and sugar and steamed with a slice of banana. In Asia many sweet dishes include beans or taro (which is a bit like a sweet potato). In the version we made we used mung beans which were pre-soaked before being steamed. 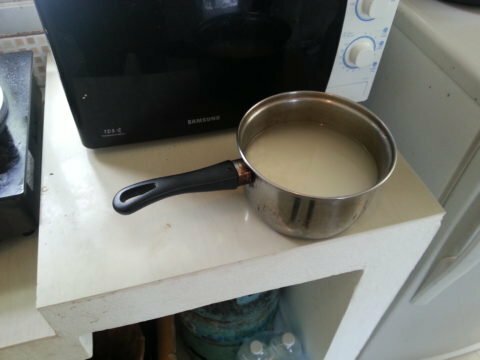 The first step is to soak your sticky rice. Sticky rice also known as glutinous rice needs to be soaked first to soften it and then steamed. 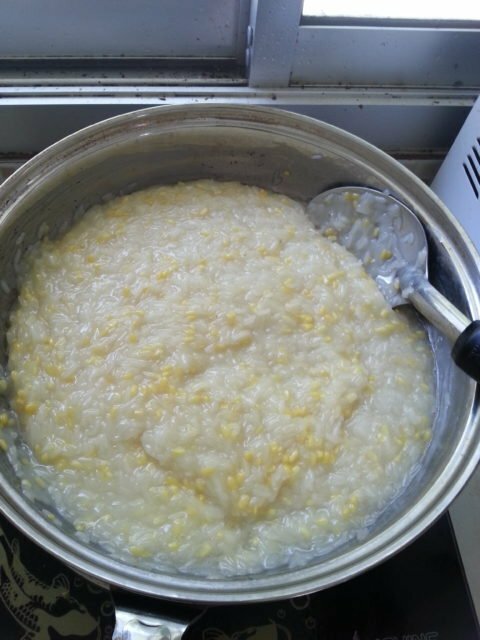 If you try to cook sticky rice the same way as normal rice using the ‘absorption’ method the rice won’t cook properly. 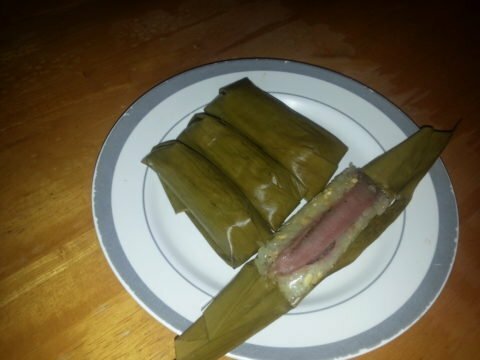 To make you khao tom mak you need banana leaf. If you happen to have bananas growing in your garden then you need to cut the leaves down an hour or two before. 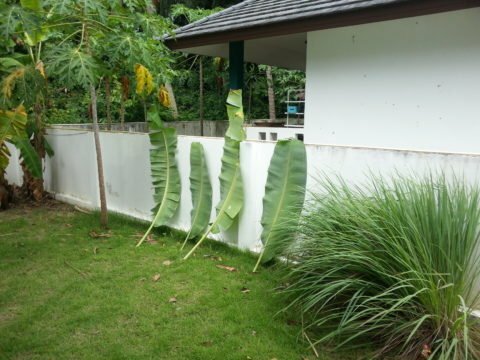 Freshly cut banana leaves are very brittle and more likely to break if you try to bend them. If the leaves dry out a bit then they become more pliable. 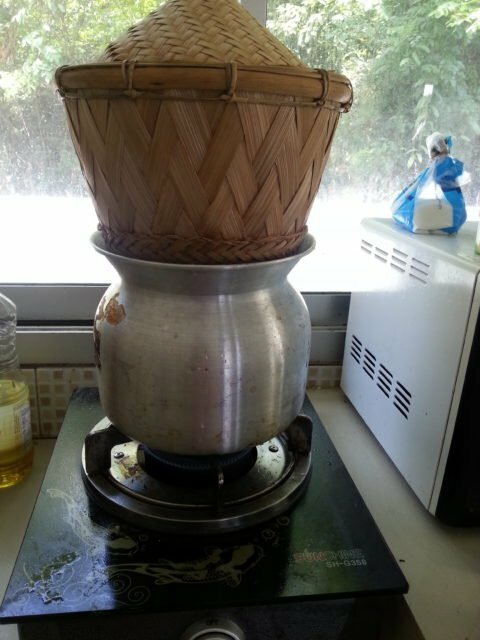 The next stage in the process is to stream your sticky rice. It needs about 30 minutes. After you have steamed the rice it needs to be spread out on a board to separate the grains and remove any pockets of moisture. 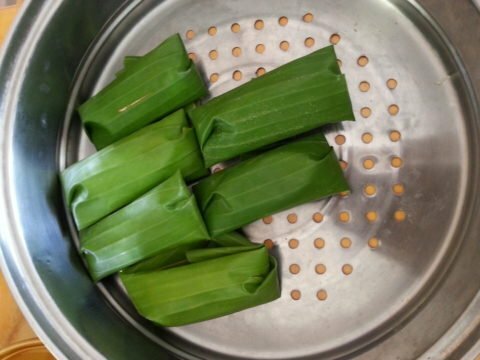 Whilst your cooked sticky is cooling, you can start to assemble the khao tom mat. 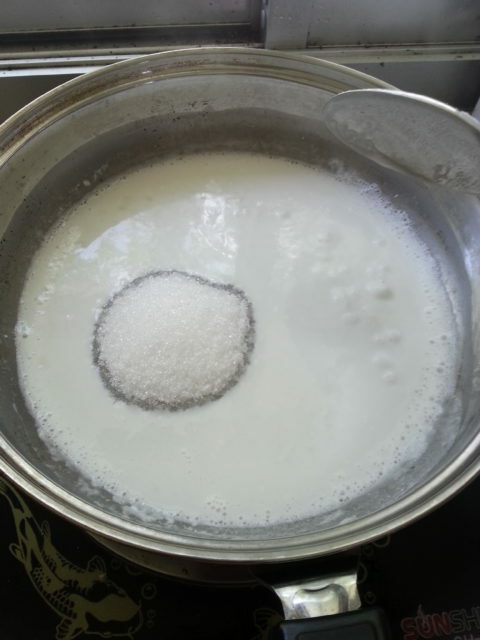 Start by heating the coconut milk and adding sugar, which should dissolve into the coconut milk. Then add your cooked sticky rice and mung beans to the pan and mix well. Next prepare rectangles of banana leaf, with a quarter of banana (cut length ways) on each piece of leaf, and spoon on the rice mixture. 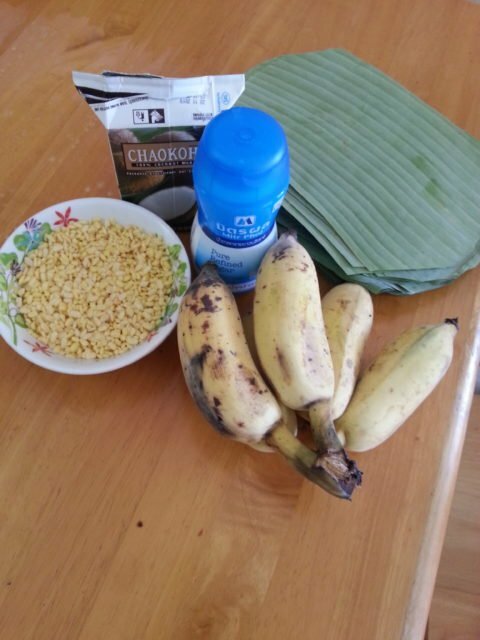 The banana will shrink in size so aim to aim the same volume of rice mixture as the size of the uncooked banana. Bear in mind that in South East Asia the native bananas tend to be short and fat. If you are using a longer variety of banana then you should half the banana in half before cutting it length ways. Once the mixture is in the leaf, fold over the edges of the leaf to create a parcel and place it in to the steamer. The idea with dish is to do a batch of parcels at the same time. This dish keeps for two to three days in the fridge. The khao tom need about 30 minutes in the steamer. You can tell when they are cooked by the change in the colour of the banana leaf. 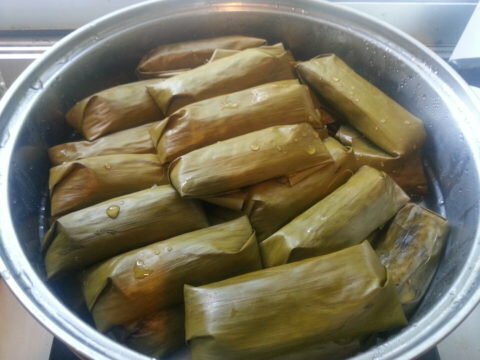 If you have some banana leaf left from making the parcels then do what Thai people do and place a large square over the top of the pile of khao tom mak, directly under the lid. Leave the khao tom mak for at least 30 minutes before eating them. The ingredients will be very hot, and also if you try to eat them before they cool then the rice tends to stick to the leaf. In South East Asia the dish is generally prepared early in the morning several hours before it gets eaten. This is a very cheap dish to make (if you are in South East Asia) and it gets shared around or sold very cheaply in markets during the course of a day without needing to refrigerated.